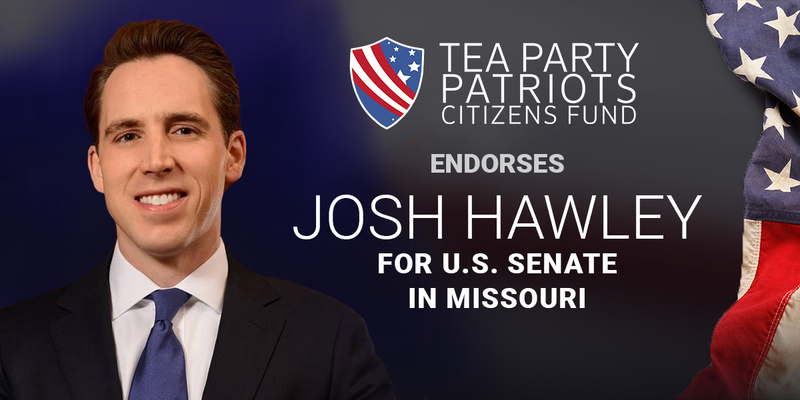 ATLANTA, Ga. – Tea Party Patriots Citizens Fund (TPPCF) Chairman Jenny Beth Martin today released the following statement, announcing that the Super PAC associated with the nation’s largest Tea Party group has endorsed Missouri Attorney General Josh Hawley for U.S. Senate. “In the contest for the U.S. Senate seat currently occupied by Claire McCaskill, Missouri conservatives have a strong constitutional conservative running – Josh Hawley. “Josh has already demonstrated his determination to stand up for the best interests of all Missourians. His work in the Attorney General’s office has made that clear. “In the U.S. Senate, Josh will work to repeal ObamaCare and overturn Congress’ illegal special exemption from that odious law. He supports a Balanced Budget Amendment to the Constitution, and the Penny Plan – a budget framework that spends just one penny less of every federal dollar spent the previous year as a means to balancing the budget in five years. He wants to go further with tax reform, to a personal income tax construct that is even flatter and simpler. He opposes Common Core, and would seek to break the link between federal funding and imposition of Common Core standards. He opposes amnesty for illegal immigrants, wants to build the wall, will work to end chain migration and the visa lottery, opposes sanctuary cities, and believes in the rule of law. “Perhaps more importantly, Josh understands the vital role played by the U.S. Senate in confirming judicial nominees. Unlike the current incumbent, Josh will work with the Trump Administration to select and confirm well qualified conservatives to the federal bench.